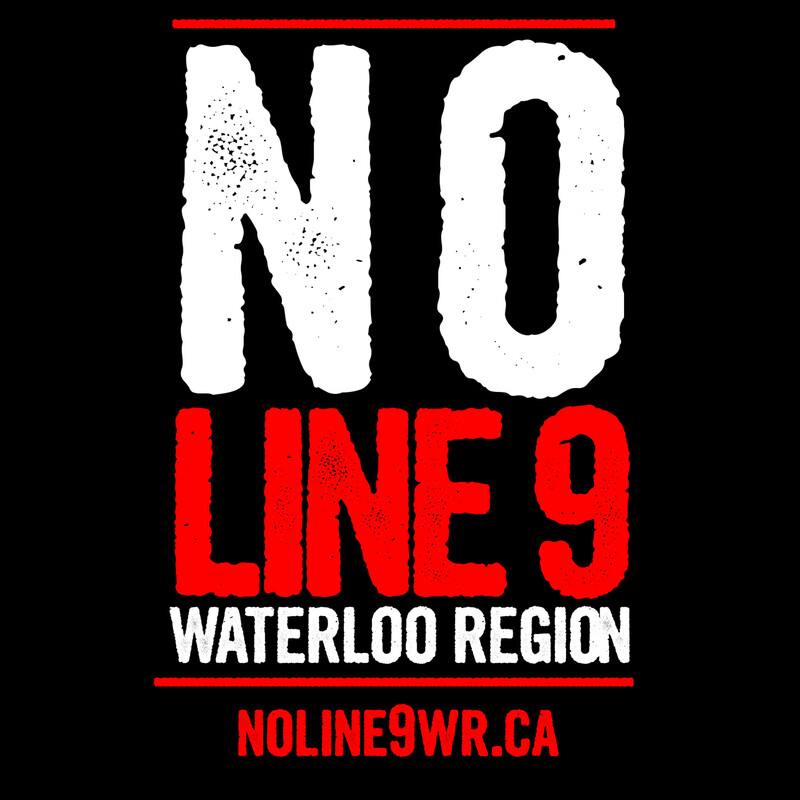 Join the Waterloo Region Against Line 9 Campaign for a friendly rally outside of the Regional Council! We will presenting our declaration and petition to the council and pushing for a resolution from the region to oppose line 9. Come out and show your opposition to the Line 9 pipeline reversal and help push council to come out against the project. We also invite people to come into the council building in a visual display of support when we present. The Council meeting is at 7pm. Kitchener-Waterloo, ON (Sept. 18, 2013) -- This evening, the Waterloo Region Coalition Against Line 9 is hosting a rally and inviting other community members to join them at Regional Council as they present their declaration against Enbridge’s plans to pump tar sands bitumen through the Waterloo Region, via the Line 9 pipeline. The declaration is now signed by over 20 local community, environmental, and public interest organizations, as well as small businesses, and over 450 individuals. The Coalition is working together to protect the Grand River watershed and to challenge the expansion of Canada’s tar sands industry. 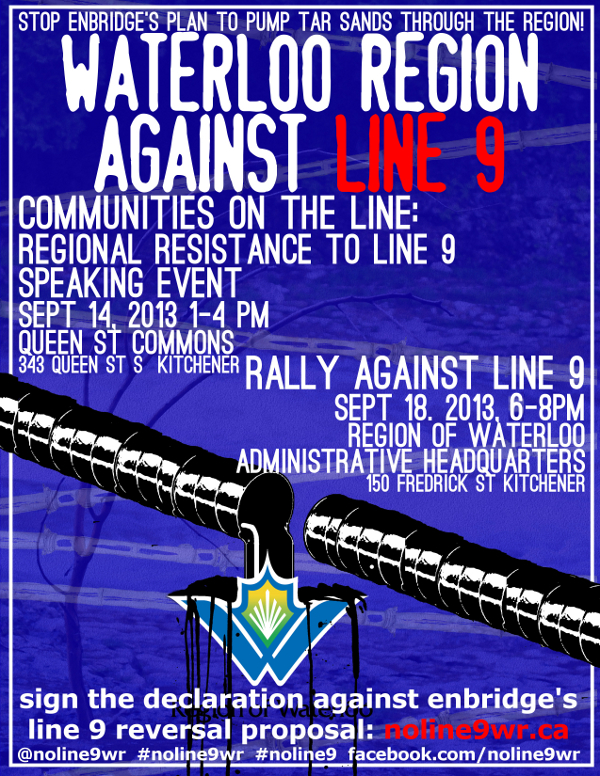 Line 9 is a 38-year-old pipeline that runs through dozens of communities, including Waterloo Region and 17 First Nations, on Anishinaabe and Haudenosaunee territory (Ontario and Quebec). In October, the National Energy Board (NEB) will be holding hearings about the controversial pipeline proposal. Members of the Coalition will be intervening at these hearings to outline their opposition. The 2010 rupture of an Enbridge pipeline in Michigan, similar in age and design to Line 9, caused the largest inland oil spill in American history, contaminating the Kalamazoo River with diluted bitumen from the tar sands. Enbridge is still struggling to clean up this disaster three years and a billion dollars later. Line 9 is also slated to transport fracked oil, the same volatile product that destroyed the picturesque town of Lac Megantic earlier this summer. Concerns cited by the Coalition include Enbridge's abysmal safety record - with over 800 spills in the past decade and widespread failure to comply with safety requirements - and the particularly severe environmental risk posed by diluted bitumen in comparison to regular crude oil. In addition to the rally tonight, the Coalition has been undertaking an extensive outreach and education campaign. On September 27, the Coalition, joined by other communities in the watershed, will be bringing their messages to the Grand River Conservation Authority as well. Other communities along the pipeline route have voiced opposition to Enbridge’s proposal, including in Aamjiwnaang/Sarnia, Six Nations, Hamilton, Guelph, Toronto, Kingston, Kahnawake, and Montreal. These communities will converge in Toronto to demonstrate their resistance to the Line 9 reversal on October 19th, the last day of the NEB hearings.